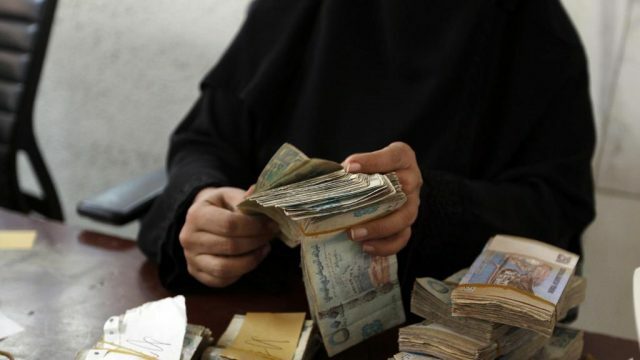 Yemen’s currency has risen sharply following Saudi Arabia’s announcement of a US$2 billion (Dh7.3bn) cash injection, bringing hope of relief for citizens struggling with high prices in a country that imports most of its food. The economy of the Arab world’s poorest country has been pushed to the brink of collapse by a civil war that began with the takeover of the capital by Iran-backed rebels in September 2014. The government has been unable to pay salaries for more than a year, and the rial has more than halved in value against the dollar, leaving Yemenis unable to afford food staples and bottled water. The Yemeni currency rose 16 per cent against the dollar on Thursday, a day after Saudi Arabia announced a massive cash injection in the central bank in response to a plea for help by Yemen’s president and prime minister. “As the value of the rial goes up, the living conditions of Yemeni citizens will change for the better,” the Saudi information ministry said. Yemen’s rial stood at 215 to the dollar in early 2015 but had dropped steadily to about 500 against the dollar this month. On Thursday, money changers across the country – including in the rebel-held capital Sanaa and the government bastion of Aden – reported the dollar trading at between 420 and 450 rials. The Saudi-backed government has now capped the exchange rate against the dollar at 390 rials, but money changers across the country appeared to have turned a blind eye. President Abdrabu Mansur Hadi transferred the central bank from Sanaa to Aden in 2016 but the rebels still operate their own central bank from the capital. Meanwhile, Saudi Arabia sent its ambassador Mohammed Al Jaber to Aden on Thursday, three years after he fled Yemen as the Houthis overran Sanaa. Prime minister Ahmed bin Dagher, receiving the ambassador, thanked the kingdom and asked Riyadh and Abu Dhabi to send experts to audit the funds transfer, the loyalist news agency Saba reported. Saudi Arabia and the UAE are leading members of the military coalition that intervened in the Yemen conflict in March 2015 to support the country’s internationally recognised government. The war has left more than three-quarters of the population in need of humanitarian aid and 8.4 million at risk of famine, according to the United Nations.